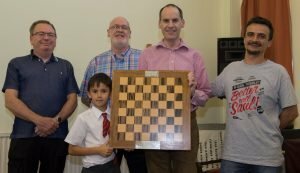 Camberley Chess Club History - Here is a brief history of Camberley Chess Club. Camberley Chess Club was inaugurated in 1972 on the back of the huge media (chess on television !) interest in the Spassky-Fischer world championship match in Reykjavik, Iceland. 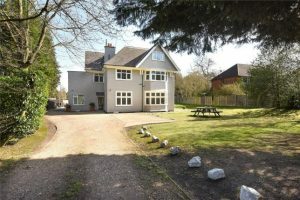 The idea came from four times British Ladies Champion Major Patricia Anne Mothersill (née Sunnucks) to open her spacious home at 28, Brackendale Close for weekly club nights and matches. Anne was a director of BMS Chess Supplies Ltd. which retailed chess books and equipment which the grateful membership purchased ! Anne passed away on November 22nd, 2014 at a retirement village in Meadow Park, Braintree, Essex. The most notable early member was Keith Bevan Richardson who was master strength and was one of the world’s strongest correspondence players. John E Upham (aged 14) Paul A Lamford, John G Trevelyan (WLS), Stephen C James (WLS), Gaynor D James (WLS), Ken Preston-Wyse, Mark A Johnstone (aged 13), RC O’Neil, David V Lofts, Adrian G Lofts, Sean Gaynor and Alec John Aslett. 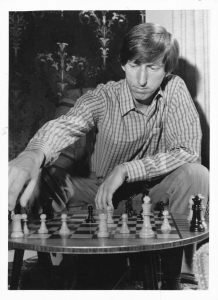 In 1976 Keith Richardson was awarded title of Correspondence Grandmaster, the first such winner of this title from the United Kingdom. 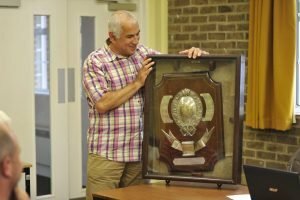 Our first big success in local leagues came in 1977 when we won The Waecheter Shield which is the huge Division One trophy of the Surrey Border League and since then a further four times. In 1978 John Upham went to UCL to study chemistry and in 1979 Mark Johnstone left the area to become a barrister. I joined the club on the 21st of August 1980 and played David Lofts on my first visit. It was a Two Knights Defence and was a 28 move draw. I also played Cliff Collis , George Berzins and Peter Putt who remained in the club many years . A few years later Sean Gaynor rejoined and to this day he is good friends with me . The first match I ever played for Camberley was at Guildford and I won. 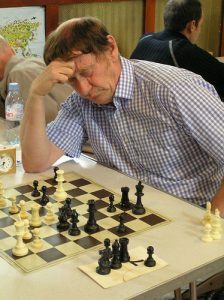 Frank Woolford used to play board 1. Other players were Russell Brittan, Albert Rowray and Geoff Rideout . Keith Richardson only turned out against Guildford in those times. 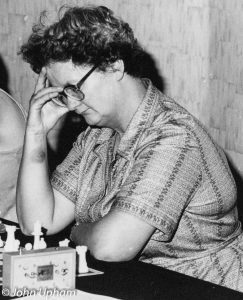 I found out about the club when I bought some chess books from Ann Sunnucks who won the British Ladies title more than once . When I joined it was held at France Hill school and we had to pack up at 1030 as the caretaker would throw us out ! in 1982 we relocated to Camberley Baptist Church, Frimley Road which is the current venue meeting on almost all Tuesdays. 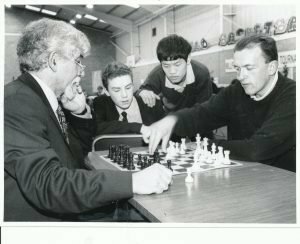 During the 1980s the club had teams playing in the Thames Valley Chess League. I joined the club in late September or early October 1982, I think, so in time for the start of the 1982-83 season. The first match I played was on 14 October 1982. In 1983 we won the Haslemere Trophy for the first time. Since then we have won it twice more. Next to join of note (around 1984) was FM Richard M Webb. 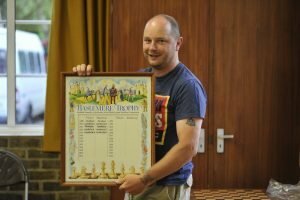 We first made an impact on the Berkshire Chess Association in 1984 by winning Division Three and then in 1994 we won the Division One Trophy for the first time. Since then we have won Division One a further five times, Division Two twice, Division Three two times and Division Four two times also. 1998 marked our first victory in the Bell Trophy. The Bell Trophy has provided us with more successes than any other competition with a total of nine victories, more than any other club in the Surrey Border League. Somerset, WP, Aslett, Alec J, Birch, GG, Birch, Ian P, Gaynor, Shaun A, Lymbouris, Dino, Lyne, CJ, Martin, Andrew D, Richardson, Keith B, Holland, B, Duvall, Ian, Scott, PP, Sommer, Martin C, Putt, Peter FJ, O’Neill, Richard, Sommer, Matthew C, Morrison, Thomas, Sloane, Paul, Pennington, Richard, Carr, Colin D, Wooding, R, McDonald, JN, McCubbin, A Sandy, Welford, Richard, Green, Fred, Thomas, David, Townsend, Stuart A, Moncrieffe, S, Kunas, M, Yahia, D, Khalie, ?, Thomas, K, Brady, Liam, Brown, Allan, Wilkinson, Graham, Broner, S, Tart, P, Devonshire, Edward, Phillips, Alec A, Smith, Timothy, Truslove, Arthur, Augousti, Michael J, Carney, Andrew, Elstrop, Matthew D, Nadavajah, R, Squires, Julian, Knight, Christopher J, Revans, T, Revins, T, Knight, Isaac. 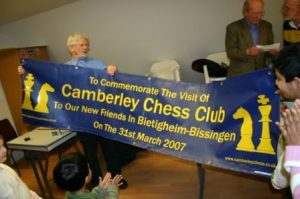 On October 5th 2002 we registered camberleychess.co.uk and courtesy of Martin Wallman we published our first web site. Even at this early stage we published details of the thriving junior part of the club which had around 20 – 30 junior members. The very first version of the site looked like this. On Saturday, February 21st 2004 almost all Camberley members took part in the world record attempt by IM Andrew Martin at Wellington College, Berkshire for the largest simultaneous display. Pictured here is Prof. Gordon Birch. By 2005 we had a healthy membership including around twenty junior members most of whom were recruited by International Master Andrew Martin who was our board one player. 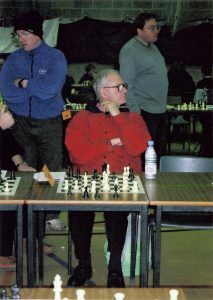 In March 2007 a club contingent spent a very enjoyable weekend with our twinned chess club in Bietigheim-Bissingen, Germany. The trip was organised by our current Secretary, Ivor Kelly. We won the Premier Precision Trophy once in 2014 and the runner-up trophy, the Mick Tarrant Plate four times to date. 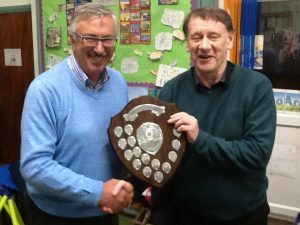 Our annual Most Improved Player of the Year Trophy in 2017 was won by Club Treasurer Paul Sloane. The award is annually presented by Colin Lyne seen here.